Admire close-up views of Mt Rainier’s snow capped peak, one of Seattle’s most iconic sights, on this full-day nature tour. 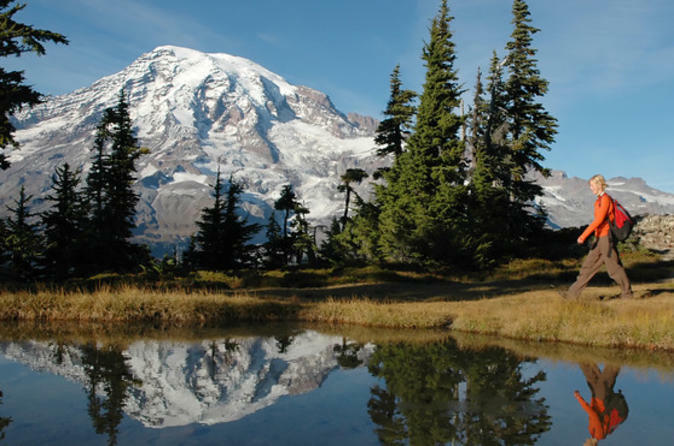 See glaciers, waterfalls and wildlife in Mt Rainier National Park with a naturalist guide, and get a vivid sense of the mountain’s beauty while walking or snowshoeing, depending on the season. This small-group day trip limited to 10 people includes French-pressed coffee, pastries, light snacks, a picnic-style lunch with local wine and downtown Seattle hotel transport by luxury vehicle. Set between the jagged Olympic Mountains and the volcanic peaks of the Cascade Range, Mt Rainier — an active volcano encased in snow and ice — is the tallest peak of them all, standing 14,410 feet (4,392 meters) above sea level. After your downtown Seattle hotel pickup, you’re driven about two hours to Mt Rainier by Mercedes minivan or luxury SUV. Admire the surrounding old-growth forest, lakes, waterfalls and stunning wildflower meadows, and enjoy French-pressed Seattle coffee and pastries before setting out on your walk. Depending on the season, your naturalist guide leads your group on a short walk or snowshoe trek (weather permitting) along the Nisqually Vista Trail, or possibly something a little more challenging if your group is up for it. Binoculars are provided to help you spot birds and wildlife like marmots, elk, deer, fox and maybe even the coyotes and black bears that roam the mountainside. Throughout the day, you'll make plenty of stops for photo ops and provided light snacks. Your full-day Mt Rainier tour includes a family-style picnic lunch of locally sourced, organic food, accompanied by regional wine; if the weather isn't suitable for outdoor dining, you'll eat inside the visitor center. After the 2-hour drive back to Seattle, your tour ends with downtown Seattle hotel drop-off.